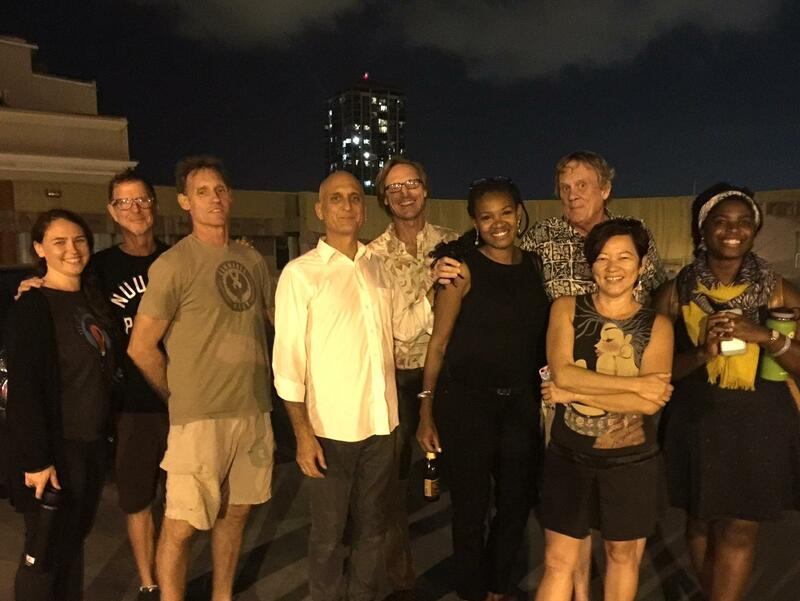 (l-r) Sarah Bauer, James Friedman, Jody Jenkins, Rich Richardson, Mark Tarone, Allana Coffee, Richard Duggan, Noelle Kahanu, and Nancy Amaka stand on the rooftop of Marks' Garage. The big 15th Anniversary "Raise the Roof" party is set for November 19, 2016, 6-10pm. These paintings by Cheyne Gallarde are among the fine artworks that will be on sale in the Art Emporium tent. Mixed media, glass, watercolors, and more will all help raise funds for the ARTS at Marks. The ARTS at Marks Garage is a unique community organization, a gallery, an incubator, a performance venue, a safe space, it has played a pivotal role in the rejuvenation of Honolulu's Chinatown. 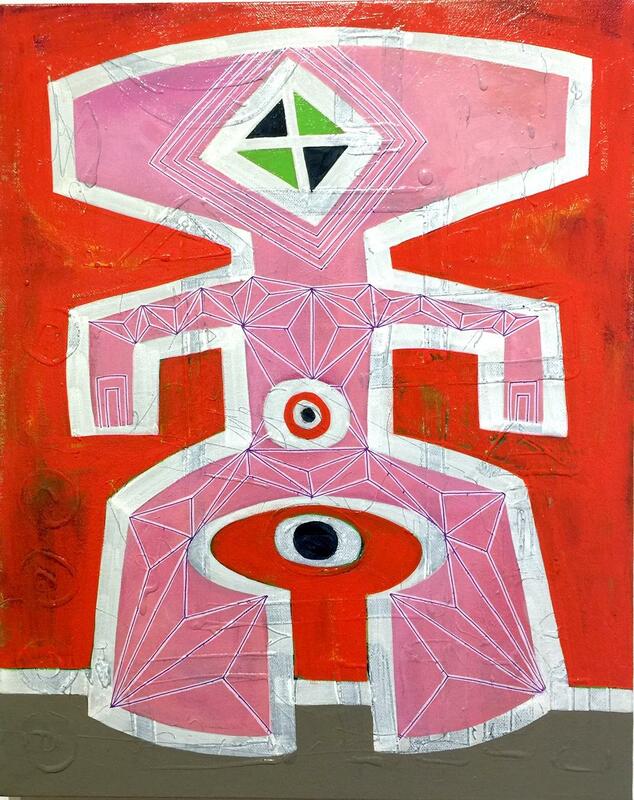 Carl Pao, "Ki'i Kupuna: Maka," acrylic and shellac on canvas, on view now in the ARTS at Marks gallery. YouthSpeaks Hawai‘i, Hawai‘i Craftsmen, Pa’i Foundation, Hawai‘i Shakespeare Festival, acting classes, art shows, the thriving Mendonca Artists’ Lofts, the fact that the ARTS at Marks has been pivotal in the revitalization of Honolulu's Chinatown, these are just a few of the reasons to celebrate this weekend. The ARTS at Marks Garage celebrates fifteen years of community this Saturday night, November 19th, on their rooftop in Chinatown from 6-10pm. Taimane leads the entertainment lineup which includes Afro-Funk band Good Foot, and HPR's DJ Mr. Nick. Find “Raise the Roof” tickets at the Marks Garage website. The mission of the Arts at Marks Garage is: To transform our community with the power of the arts and establish Honolulu's Chinatown as the creative capital of the Pacific. After fifteen years on the job, the transforming community part is coming along well. Marks is an incubator for over a dozen performance and visual arts groups, there are numbers of youth programs, over one hundred fifty events staged per year and well over forty five thousand visitors participate per year. Few, however, have ever been to the roof of Marks Garage. With no elevator,it can be a bit of a haul, but community builders are tough. Carl Pao, (top to bottom) "Makalau Kea," "Makalau," and "Makalau Ula," all are sublimation on aluminum, on view now at the ARTS at Marks gallery. Theatre sign. Arts promoter Mark Tarone says a party on the rooftop came to them about a year ago, and the amount of space was inspiring. “Fifteen years ago, about, we did the first First Friday.” Richard Duggan is one of the old timers. Youth today don’t remember when Chinatown had no cute clothes shops, no local jewelry and arts, no French Latin bistro, no Vietnamese fusion food, no gourmet pizza! No live music, no trivia nights, and no Marks Garage, one seed project that took root and is building community. “I think people need to spend some time together to feel like they belong here in our urban core, and that’s a healthy thing to do right now.” ARTS at Marks’ Executive Director Rich Richardson is not prone to hyperbole. Others on this planning committee see the moment as ripe for just what Marks’ offers. After a renovation, February will mean new partnerships as Marks becomes a hub for alternative travel. City funded clean bathrooms and advice right in Chinatown, plus ways visitors can learn and contribute to local communities through travel. Board member Allana Coffee sees reason to celebrate. Some adventurous Honolulu ceramists have set the tables at Mark’s Garage with dinnerware you may not have seen the likes of before. 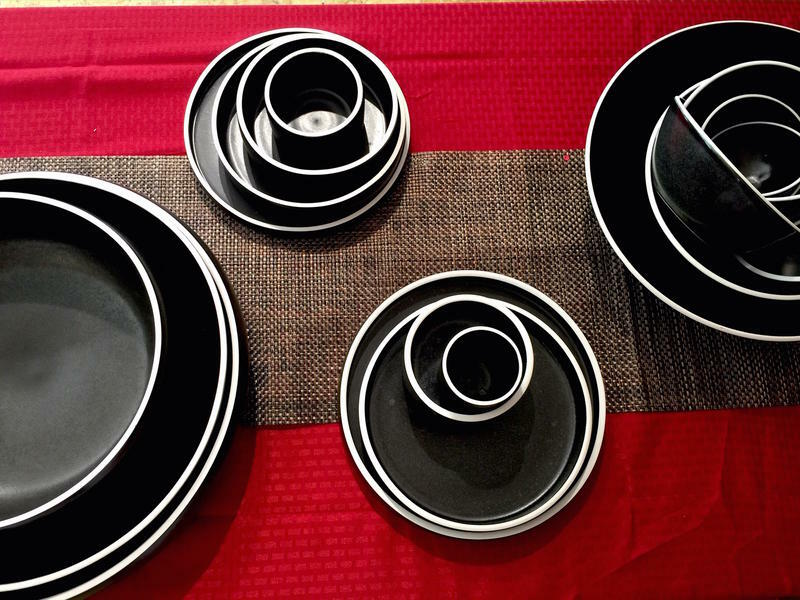 HPR’s Noe Tanigawa found well-made new ways to serve your next meal. “Dinner Party” continues at Mark’s Garage through October 1st. Artist Mariko Merritt is one of the ten ceramists showing in the Dinner Party exhibition at Marks’ Garage. She watched the show’s instigator, Daven Hee, as he made some imaginative mini pourers—perfect for shoyu. 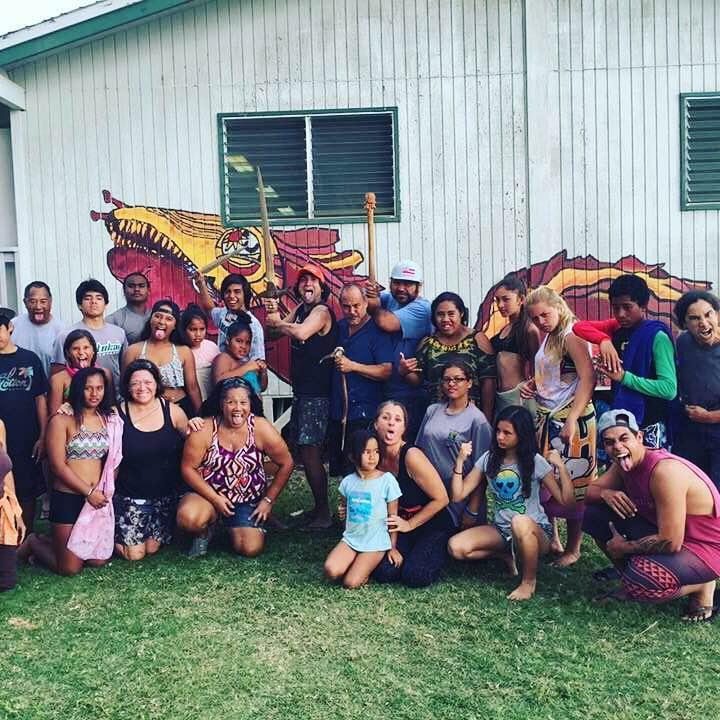 The Native Hawaiian arts community is growing in strength and diversity, as exemplified in Maoli Arts month celebrations over the last several years. Now, in its eight year, Maoli arts month, or MAMo, is looking to the future.